Replies: 64 (Who? ), Viewed: 76325 times. #1 26th May 2008 at 8:37 PM Last edited by plasticbox : 2nd Jul 2008 at 10:30 PM. Polska wersja tego poradnika jest dostepna na: http://forum.thesims.pl/showthread.php?t=44436 (wymagana rejestracja). 3. Voil�: fake row house. Only use 100% flat lots for this. 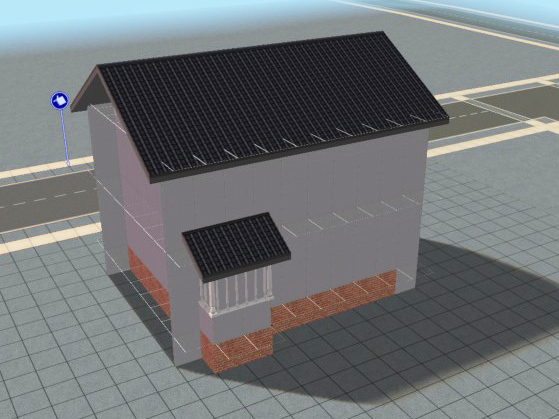 If the edges of your final lot aren't 100% flat, you won't be able to place your finished row houses next to each other -- the simplest way to achieve this is to build on a flat lot in the first place. If you're not sure whether your neighbourhood is flat, put down a blank lot first and bulldoze it: this will leave a 100% flat area. 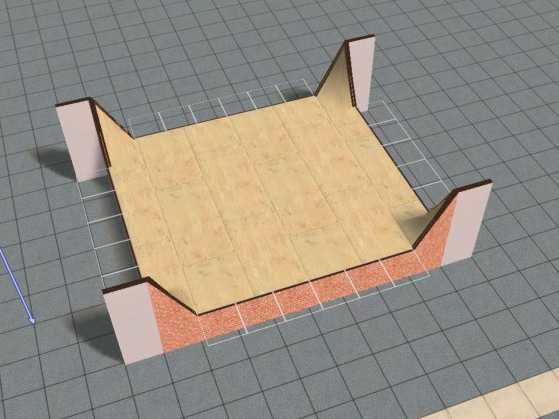 You can also use the Lot Adjuster option "Lot Edges: Flatten" to ensure that the edges of the shrunk lot will be flat. Don't build anything on the area you want to shrink or on the edges of it. The LotAdjuster won't shrink your lot if you do. If your lot is inhabited, make sure that no sims are in this area. Make a backup of your lot before your shrink it. Simply package the lot from in-game, or put it in the lot bin and down again (from NL on, this will leave a copy of the lot in the bin). Having a copy is not only useful in case you forget to build something (then you don't need to quit the game in order to re-expand the lot), it's also important for troubleshooting: in case anything doesn't work right with the LotAdjuster, it's essential that Mootilda can look at the unshrunk lot. Always playtest shrunk lots before sharing them. This is entirely based on the work of Mootilda and others. Thanks to Mootilda and everyone else involved in the development of the LotAdjuster: aelflaed, Inge Jones, MaryLou, niol, Mutantbunny, Rascal, Simsample, KariMinger/Zazazu, DocDoofus, behold_the_muse, baratron, dizzy, ladykatsim, JMP, ebonyspiral, MadameMim, ikbod, mildlydisguised, Emma, Quinctia, maxon, alexpilgrim, CatOfEvilGenius and everyone else. Firstly, you need LotAdjuster 1.1; you will also need the .NET framework to run it. For any questions regarding the LotAdjuster (not its use), please refer to the official download thread, in particular the tutorial posted here -- I'm not going to provide support for the software itself here, I'm only explaining one particular use of it. 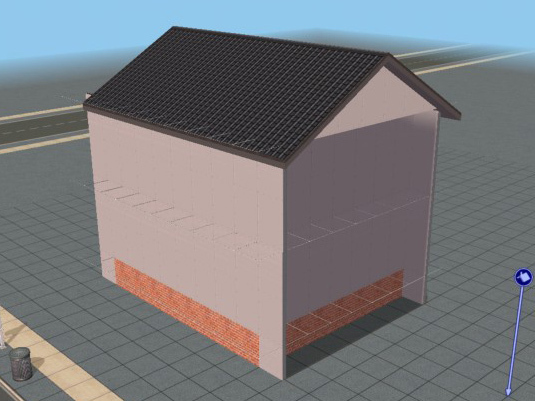 I'm building a row house for a 1x3 lot, so I need to start with a 3x3 lot (I'm going to shrink it only on the left and right, so I don't need extra space in the back in this case). 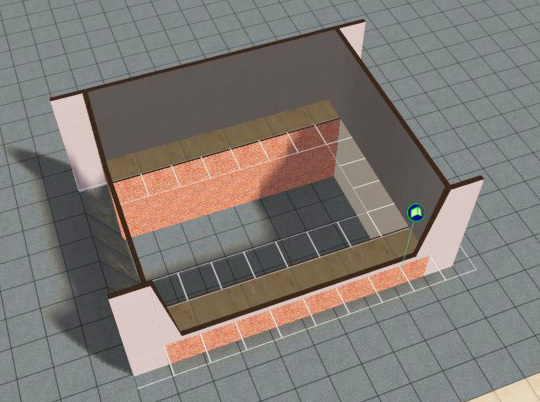 You only need to do this if you want a house on a foundation, of course -- if all you need is regular walls, make a box of walls instead and add plain old regular walls for the "fake walls"; then you can skip to step 2. Then build the rest of your house on top of this construction. Save, exit to neighbourhood and make a backup of your lot (by packaging it, or by putting it in the lot bin and back). Quit the game. 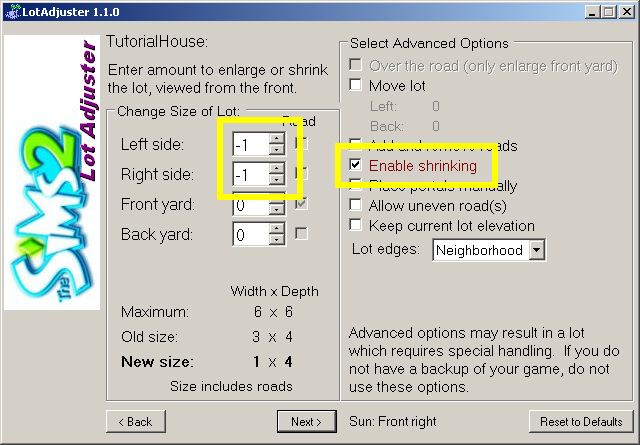 Click "Enable Shrinking", and set the Left and Right fields to -1. Note how it says "Old Size: 3x4" -- this is because the size includes the road. 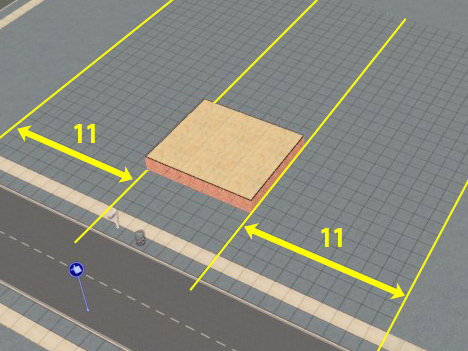 The road is 1 unit wide, the lot itself (the buildable area) is 3x3 -> 3x4 together. Click Next, and if you've done everything correctly it should shrink your lot. Exit, and restart your game. When you re-enter your neighbourhood, the lot will still appear with its old size. Don't worry about that, it will be fixed in a second. 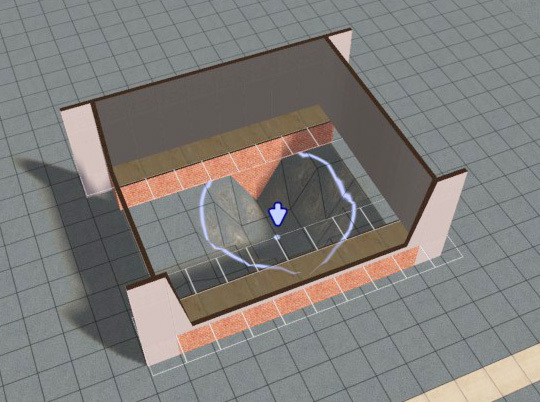 In order to get the game to register the new lot size (we changed it behind its back, after all), you need to do at least one small building action now -- add/remove a floortile or a bit of inside wall, for example. In my case, I did most of the building after I shrunk the lot. Build the rest of the house, save and exit the lot, done. You can place these next to each other, move them around, put them in the bin and back .. they work just like any other lot. Walls and roofs built in this fashion have been confirmed to be Seasons-proof. * Be aware that you cannot build anything along the edge of the area you want to shrink -- not even fences. You can add them after the lot is shrunk, just not before that. The LotAdjuster won't shrink your lot if you do. This is because the game cannot handle walls along the edge of a lot (and there's no easy way to distinguish between a wall and a fence, from the game's point of view -- not allowing the fences is a safety precaution, not a bug). * All of these can still be deleted after the lot is shrunk, with the exception of foundations: those you can only delete within the normal limits (2 tiles in from the lot border). For larger basements, build them beforehand. * If you find you've forgotten something, you can always re-expand the lot, change stuff, and then shrink it again -- so don't worry too much. * Keep in mind that you might want to play this lot with visible neighbours on: your viewing area will be smaller than normal when the neighbouring houses are getting in the way. Plan your floorplan accordingly. 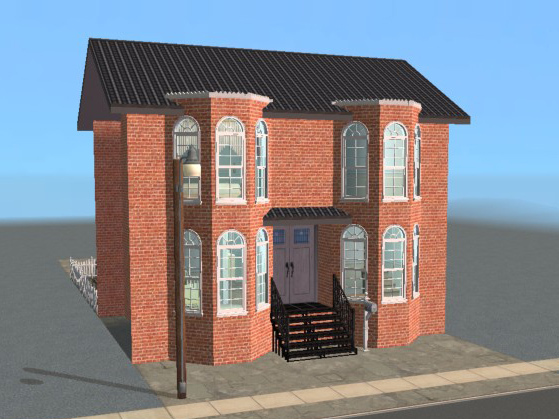 * I normally play houses looking towards the street; row houses I prefer to play from the front side because otherwise I can't see the sidewalk when looking at upper levels (I can't peek around the sides of the house like normal). For me, this means that large pieces of furniture (showertubs, pianos) should never be parallel to the street in a row house, they block the view inside the house. * Make sure your mailbox and other important things are still accessible when sims can not walk around the house. * It's still perfectly possible to put driveways in the back of a house -- cars will teleport from there anyway. Please let me know if anything is unclear with this tutorial (DO NOT PM ME, post here) and I will try to explain it better. Again, I do not provide support for the LotAdjuster -- any questions on installing/using it, please refer to the LotAdjuster thread. This thread is only about building issues. Have lots of fun with this! #2 26th May 2008 at 8:38 PM Last edited by plasticbox : 27th May 2008 at 7:09 PM. The one-tile "dead zone" inside the side wall of row houses built like this isn't as useless as it may seem -- firstly, the inside of the house is easier to view when neighbouring roofs don't get in the way; secondly you can use it to hide the slope of a basement. 1. When you have the basic construction in place, delete the foundation like shown (you'll want to keep the outermost tiles on front and back). Note that your foundation will need to be 6 clicks or higher if you want sunlight in your basement. 2. 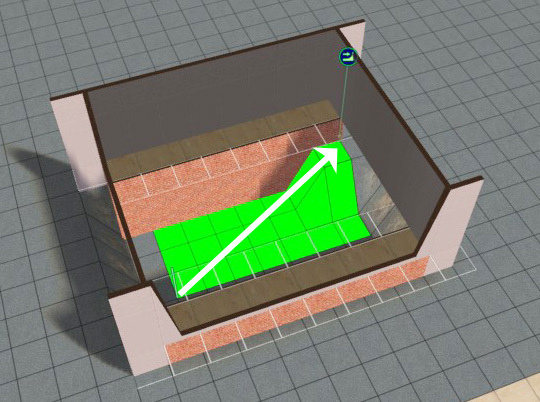 Lower the ground inside the basements to 16 clicks below first-floor level (the foundation in my example is 6 clicks high, so I need to lower the ground by 10 clicks). See also Backdoor Lane 46 and Backdoor Lane 48 for practical examples. #3 26th May 2008 at 8:38 PM Last edited by plasticbox : 27th May 2008 at 7:28 PM. * Are you using the correct version? Like it says in the title of this thread, this will only work with version 1.1 and up. * Try shrinking one side at a time to narrow down what the problem is. In case you're having trouble with portals, the Portal Revealer may be of help. Pizza dudes don't deliver directly, they walk up and down the sidewalk instead and then drop off the pizza at the doorstep and leave. It's not a major issue, as the sims can eat the pizza just fine and are also charged for it. This is apparently a routing issue -- my personal theory is that the dude thinks the back door is the front door, and drops his delivery on the floor since he can't get to that door. The frontdoorhack from MATY (same procedure as above: go here and look for frontdoorhack.zip) should fix this: "Deliverypersons should no longer be irresistably drawn to the inaccessible door of the mausoleum in the backyard" (from the rtfm). 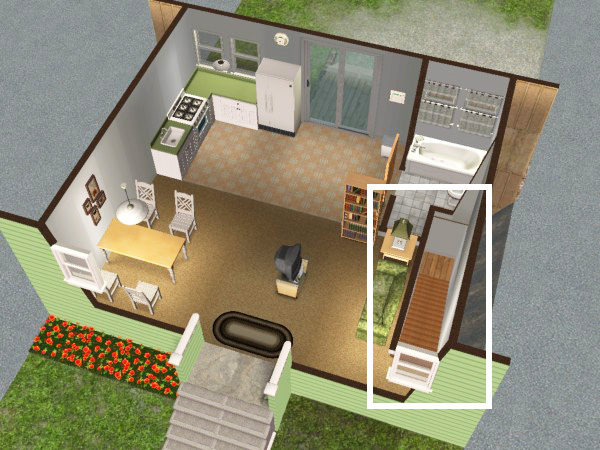 This is a useful hack for regular lots as well -- I use it, and my own sims always seem to know where "front" is. Beach lots have special EA-imposed areas within the lot, such as the beach area and the water area. Because of this, there can be issues with beach lots which are shrunken in particular ways. For example: the water occurs on the side of the lot furthest from the road; if you shrink a beach lot at the back, you will obviously lose the water. The beach area is the row next to the water, if you shrink a beach lot too much at the front, you can remove all buildable areas. As well, beach lots are very finicky about their placement within a neighborhood; shrunken beach lots are equally finicky. Be aware that you can shrink a beach lot so that it has different requirements than the standard beach lots. Another issue with beach lots is the beach portals. There is one beach portal on every tile at the water's edge. Before shrinking a beach lot, I recommend that you use the Portal Revealer to remove unnecessary beach portals from the area to be trimmed. #4 26th May 2008 at 8:38 PM Last edited by plasticbox : 27th May 2008 at 6:17 PM. For a list of known issues with small lots / my lots that have nothing to do with the fact that they're row houses or shrunk, please see this post. I followed your directions but the LotAdjuster still tells me the roof is in an "invalid location". Can you post a screenshot or two? Please provide an overhead of the lot *with gridlines on*, and a closeup of the roof. Here are the screenshots...one from overhead and one from each side with the roof up. I can't see what's blocking hotbeeyatch's lot. Roof and fake walls seem to be okay. I assume you are only trying to shrink left and right sides. Is it possible the garage door is upsetting the LA? 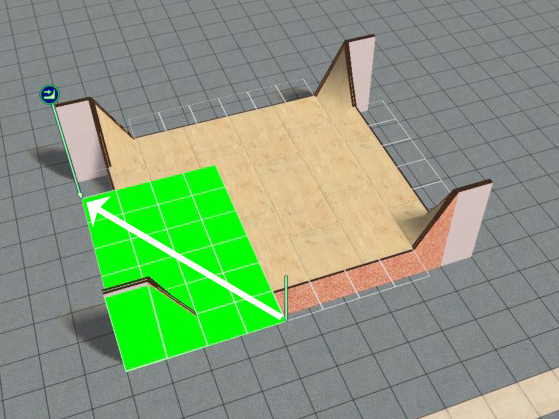 I believe it should just bump over to the next gridline - that's what happens to build objects (like columns) that are too close to the edge. However, maybe garage doors work differently? One small possibility when you can't see what's blocking the shrink - if you have an invisible fence, well, it's invisible! I once put a bit of fence like that (by accident) onto a lot I wanted to shrink, and it took ages to find and delete it. Another way to narrow it down - try shrinking just one side of the lot at a time. Which version of the LotAdjuster are you using? 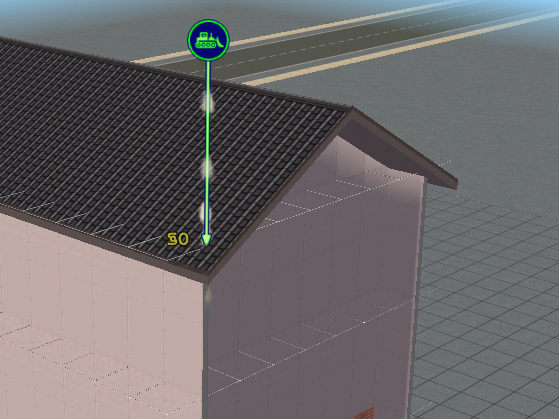 LA 1.0 doesn't allow roofs to touch the edge of the lot; LA 1.1 does. It looks like that is the problem...I have 1.0. I'll go grab 1.1 and try again. Thank you! Not sure what will happen to the driveway .. those do not fit onto a normal 1 tile wide lot. I'd remove that before shrinking. Plasticbox, feel free to put any of those tips I mentioned in your tute if appropriate. I put them there for general reference. Which tips do you mean, are you referring to your post above? Invsible fences? I'd rather not include that one in the main tutorial .. I don't want it to look more complicated than it is, with all eventualities covered. "Area must be empty" should be enough I think? One of the reserved posts above is meant for troubleshooting, that's where this kind of thing shoudl go in my eyes. Along with "Please read the title of this thread again: do you have LA 1.1 in the first place?" #15 28th May 2008 at 12:11 AM Last edited by CAROLUS : 20th Jun 2008 at 9:45 PM. A great thank you to plasticbox and Mootilda(and others I do not know) for their efforts to improve the game. Which tips do you mean (...) "Area must be empty" should be enough I think? (...)Along with "Please read the title of this thread again: do you have LA 1.1 in the first place?" Sure, just offering permission if you wanted to add such tips. I think the most generally useful one would be "Try to shrink each side separately to discover where the problem is on your lot". Or similar. And yes, making sure they have the correct version would be a wonderful thing! 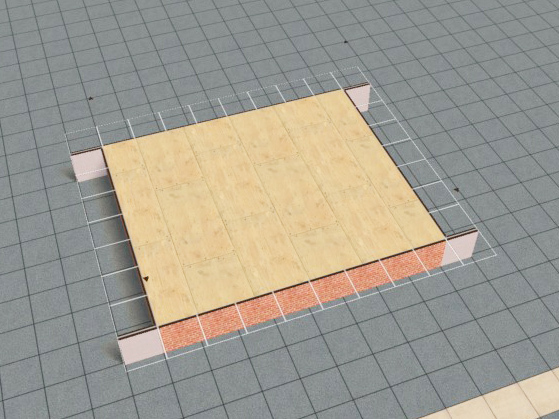 Poplers, floortiles can be placed up to the very edge of the lot before shrinking, so yes, you can have a flat roof. Carolus, that Egyptian house looks fabulous - where did you find the doors and windows? for ingeli:The windows is a logcabinfence you will find here on mts2. The door is a curtain by k8 at Parsimonious. The lot can only be modified after it has been built on. 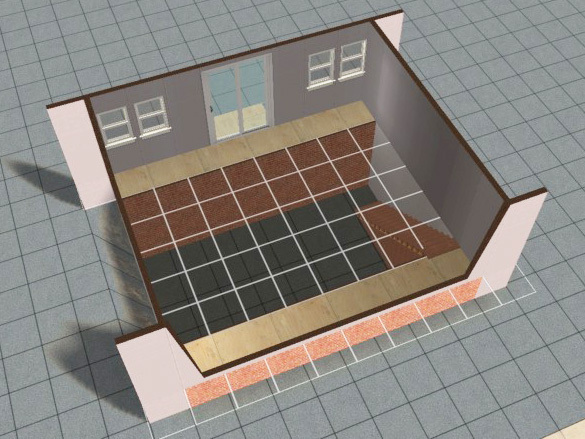 Oh, and will it also work with Kitchen and Bath Interior Design Stuff? 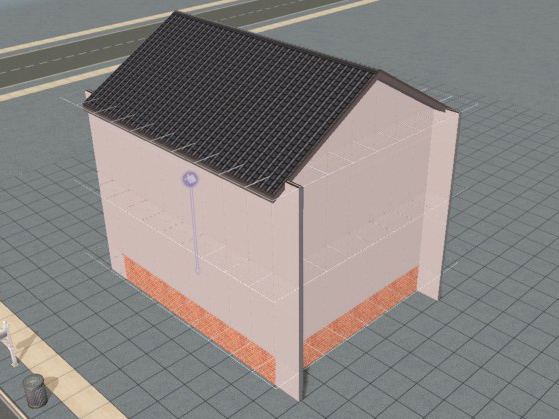 I means after placing the lot in the hood, you have to have gone into it and done even just a tiny build (like a square of foundation) and then save the lot before you should open it in the Lot Adjuster. You should not try to adjust completely unplayed and unsaved lots. 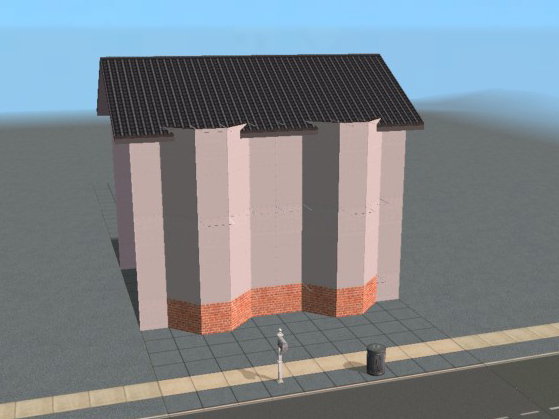 If I move the shrunken lot to the Lots & Houses bin is it best done with a vacant lot to avoid file size issues, or can i clean up relationships etc. as you would do moving a standard occupied lot? #23 13th Jul 2008 at 9:52 AM Last edited by niol : 13th Jul 2008 at 10:09 AM. I read that one has to also manually clean up the memory of every sims involved with SimPE simply because the lot bin and the game engine fail to clear up all the data which can lead to corruption in the latter days during their using. In such case, may press "ctrl" and left-mouse-drag to delete line by line from border to border and from the walls to keep to a border. 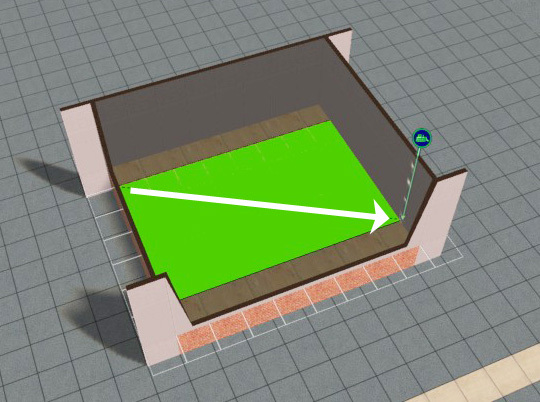 This way can ensure most walls or fences deletable by the normal wall or fence tools get removed. and if one worries about invisible levelroom walls especially the column deck, one may use the column deck to press "ctrl" and left-mouse-drag to delete lthe whole suspected area or its parts. For some EPs, removal of custom fences and saving the lot once may do the job also. Or for some EPs, use the cheat to delete all fences when appropriate. you should never move occupied lots to the bin if that's what you were asking -- regardless of whether or not they're shrunk. If your think it's similar to your creations, you are right. I just follow the master.